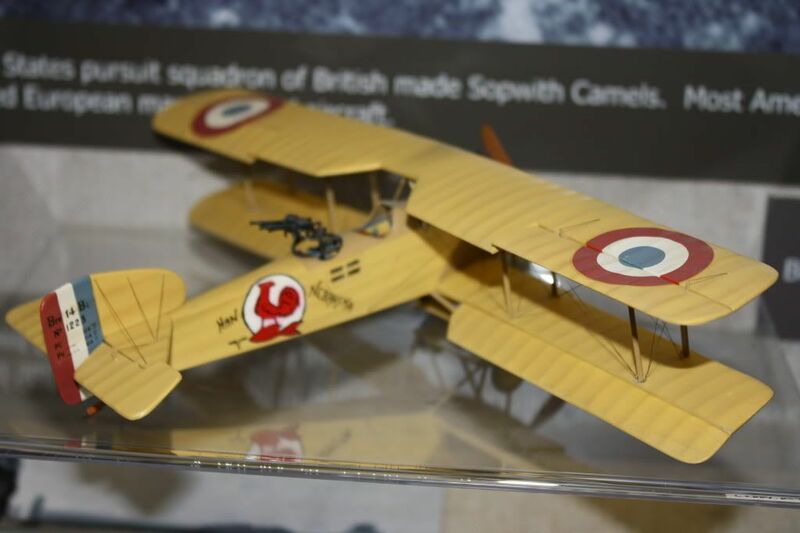 Released in 1964, the Breguet 14 was one of the two final models in Aurora's "Famous Fighters" 1/48 World War One aircraft, the Albatros C-III being the other. Built by The Société des Ateliers d'Aviation Louis Breguet, also known as Breguet Aviation, the Breguet 14 (often spelled as the Breguet XIV) is considered one of the most important French warplanes of WW1. Designed for reconnaissance and bombing roles, it was known for toughness and performance, thanks to Breguet Aviation internal structure of duralumin and steel, with a wood and fabric external construction. Powered by a Renault 12Fe water-cooled inline engine rated at 224 kW (300 hp), the Breguet 14 was fast (121 mph) and fairly maneuverable. It usually packed a fixed Vickers 7.7mm machine gun firing ahead, and single or twin 7.7mm Lewis Guns mounted on a scarf ring for the observer. The Aéronautique Militaire used them from late 1916 thruogh the Armistice and into the early 1930's! France sold and provided her allies with the type, with the American Expeditionary Force fielding sixteen squadrons of Bre.14's. Some two dozen other countries used the Bre.14, and Nakajima of Japan produced a license-built version. The Bre.14 was large, with a wingspan of over 49 feet. This Breguet is impressive with its utilitarian, boxy, all-business aesthetics. The first release was kit No.141 in 1964. In 1973 the Aurora subsidiary K&B issued the model in their 'Collectors Series,' as kit number 1141. The Breguet tooling received an overhaul, the wings being revised to include bomb racks. K&B released the models in a square box, which also included the very popular vacuform diorama display base. The dramatic Aurora box art was replaced with a colorful flying scene. This stocky Breguet 14 contains 37 parts molded in tan and black. This includes two ground crewmen, but curiously no flightcrew. The molding is improved. I found no sinkholes nor flash, though ejector marks and seam lines abound. And the unfortunate raised areas for the decals...guess it seemed like a good idea at the time. Many parts are over scale. There is no interior detail other than the seat, stick, and instrument panel. The machine guns show a noble effort by the mold maker, but they are still toy-like by today's standards. Much of the detail is soft and simplified. Almost all of the control surface horns are molded on, and out of scale. The checker pattern below the rear gunner cockpit should be open for windows. Neither the fuselage nor wings were textured to simulate fabric. The wingspan is over one foot, and a fuselage of 7.25 inches. The instructions are simple and nicely illustrated. It includes a photograph of the completed model. Aurora did not supply any rigging diagram. Painting instructions are basic. French standard G-4 camouflage was four or five colors in various patterns and makes for an attractive finish. Aurora's own brand of glue and paints is the only products referenced. The decals are over 40 years old, slightly yellowed. Markings for only a single American Expeditionary Force aircraft are provided, Bre.14 B2 No. 4348, 96th Aero Squadron, aircraft No. 8. Another trip down classic memory lane. Even today it is sought for building and collecting. They are rare and disappearing. It certainly requires quite a bit of work to correct deficiencies. It is ripe for detailing. There are several aftermarket Vickers and Lewis guns available, as are seats, struts, and wheels. The many examples of well built Aurora Breguet 14's online attest that you can make a good model from it. I only know of two other 1/48 Breguet 14s, one a multi-media by Hi-Tech, and the other a vacuform. Highs: No sinkholes nor flash mar this model. Verdict: Boxstock or super-detailed, this Breguet 14 can be an eye catcher.